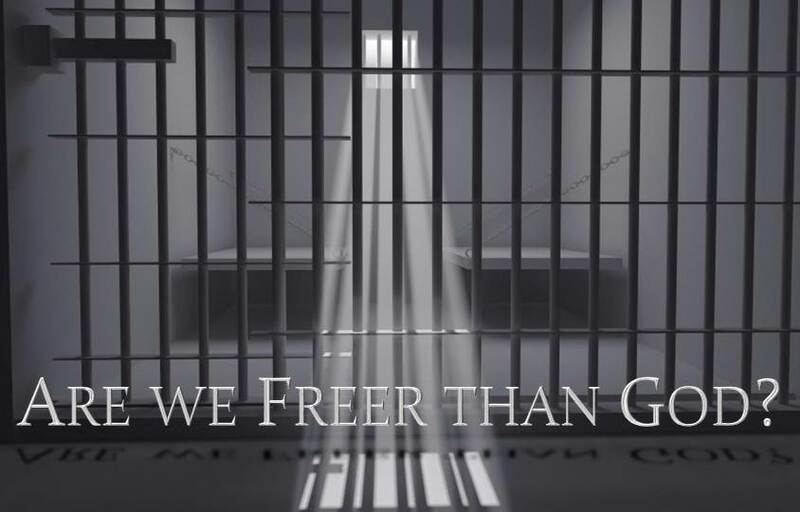 Are We Freer Than God? Note: Some words with definitions have been placed below. This has been a long time coming and to be honest, its time. The topic I am about to tackle next is a topic that has taken me years to deal with in a tenable way. The title of this article, “Are We Freer than God” is a legitimate question. Most reading this will likely state that we are not. With this being said, what many are saying they believe verses what they actually believe are two very different things. One of the greatest areas of division in modern Protestantism where debates will rage for hours is in the area of human freewill and divine determinism and their relationship to the salvific work of Christ. Both sides have concocted formula’s that follow logical flows of thought within a closed system. What this means is that the logic follows a linear pattern of thought where a thought is given clarification and meaning by the information before and after it. Meaning then is bound to a moment in time where an action takes place between the past and the future of that moment. Many understand events of human history and the workings of God within the universe using this thought process. Both sides of this argument use this process of linear thought to create cognitively consistent theories where the acts of God and human persons create a logic that is repeatable and predictable. Now, I am not slamming our attempts to understand God, what I am doing is calling into question how we do this and what our goal should be when taking on this task. Firstly, some things to keep in mind, God is a being outside of time. He is the Lord of time and is not subject to it, and because of this, attempting to construct a logic by which God acts within human history within the confines of our perceived understanding of time is a frivolous endeavor. I am hoping that this makes sense in and of itself and does not require any more explanation. In case it does not however, let me give you an example. Past, present and future are human concepts that we use to distinguish the passing of time. Yesterday was the past, today is the present, tomorrow is the future, this is how we understand our universe. God on the other hand lives in all of these moments simultaneously while also keeping track of our perception of time. If this then is the case, then God in this moment still watches His Son hang on a cross, makes a covenant with Moses, walks with Adam in the garden, and sits on the white throne of judgment spoken of in Revelation. To God all of these moments occur at the same time, with God present and working in all of them continuously. Pretty head melting huh? The first time I recognized this, was the first time I truly began to understand God for who He is and not for the person I had concocted in my head. One of the first questions I tackled with this new understanding of God was how many had been seemingly duped into believing that they were somehow freer than God was. This was (and still is) a ridiculous notion that in my mind strikes at a very real problem within modern Christian theology and that problem is idol worship, most notably worship of our autonomy. We live in a world where our perception of freewill is palatable and hard to ignore. I can choose to eat a banana, or a bag of chips, or I can choose not to eat at all, all of these choices solidify my exercise of free will. Since this experience of free will is so easily seen, it is difficult for us to discount it when trying to understand the plan of God in relation to salvation. Some go as far as to even villainize God and others if there is even the slightest hint that their free will is in any way infringed upon. But, the question remains, are we really free, and are the choices I gave above really examples of free will exercise. Before we can tackle that though, we need to realize that within our state of falleness that scripture makes it quite clear that we are hopelessly lost in sin, we cannot “choose” our way out of it, but are embedded within it. It is so engrained upon our souls that even “good” acts are done with selfishness and wickedness at their core (Rom. 3:10-18, Isaiah 64:6, Jer. 17:9, Ps. 51:5, Ecc. 7:20, Titus 3:3). Humanity then is bound to sin, it is the longing of our flesh and the compulsion of our hearts. We in no way are capable of “choosing” goodness in that state. Paul even goes as far as to describe those still slaves to sin “dead” (Eph. 2:1) in their sins. They are a rotting corpse, that can do nothing else but rot and stink, it is not capable of raising itself. A corpse is a corpse and only God can change that, no amount of self will or free will can ever raise a corpse from the grave. Even in this state, however, we have an experience of freewill, but it is the freewill to choose which evil we will ascribe ourselves to, not to whether we will do evil or not. Think of it this way, we can choose what we eat, but our choice is limited to fried chicken, Twinkies, and ice cream. No matter what we eat, if that is what our diet consists of we are going to die much sooner and with many more health problems. Within the condition of sin then, we are bound to it, enslaved, ensnared, and trapped. How then is it fair for God to hold us accountable for our rebellion if it is out of our control? Has He condemned humanity to this enslavement? Interestingly enough, there are some of us who are quite fond of sin, we enjoy it, relish in it, bath in it. No amount of pleading will get us to stop; for we are more in love with our sin then we are with anyone or anything else. What I am trying to say is, even when we had the capacity to rightly choose with actual free will…we still chose to eat the fruit, we still chose worship of ourselves over worship of God. How then have we earned the right to question God’s justice, are we so arrogant as to think that God actually owes us anything? The fact that we now breathe is a testament to his marvelous mercies for He is within His right to snuff us out from our first breathe. Let us not lose ourselves in some indignation we have not earned, or have a right to, but look at the situation as it is. In sin, we are helplessly lost, so completely and totally enraptured in our filth that things that might have once disturbed us are now tame to us. How then does any come to faith? If we cannot make a choice to follow Christ of our own volition, how then are we saved? It’s a fair question, and one that I am now going to try and answer. Within Scripture, Christ Himself states numerous times that those who follow Him do so at the volition of the Father. These are just a few examples. The point I am trying to make is this, the corpse must be called out. Jesus calls out Lazarus in John 11:43, and in so doing proves himself to be the Lord of life. In the same way, we are called out of death and sin and into His marvelous light (1 Pet. 2:9). Salvation is a process begun in Christ and made manifest in our repentance. This repentance however is not some arbitrary choice that we make, but a decision made possible by the work of the Holy Spirit already at work in us. This is a work done of God and by Him alone, not an act that saves us, but a proof that we are saved. Think of it like this, salvation is like a chemical reaction. When God works as a catalyst (that which starts the reaction) the aftermath is always the same. Think of baking soda and vinegar. Every time the two are exposed to one another, a reaction occurs and always leaves the aftermath of that reaction every time. There will never be a time where you mix vinegar and baking soda and come out with Coca Cola, or Kool-Aid. It will always be what it is. In the same way, when God takes action upon the human heart the reaction to that activity is always repentance. This is not some violation of human freedom, but is deliverance to actually be free. When Jesus calls out the crowds to repent he is calling those whom God has prepared to follow the one they were predestined to follow from the foundations of the world. This does not mean that His call to repent is not genuine for all people, but people who have hardened their own hearts do not hear the way of righteousness (Matt. 13:14-15). Do not think God unjust however, for he only hardens the heart of those whose hearts are already hard. See in Exodus where Pharaoh hardens his heart against the Moses and how God works within that process. God tells Moses before he goes to Pharaoh that he intends to harden the heart of Pharaoh and multiply His signs to make an example of him among the nations. God lets Moses know that He will be actively hardening the heart of Pharaoh, and yet within the narrative the cause of the hardness of heart in Pharaoh goes back and forth between Pharaoh himself and God. I think this tells us something about how the hardening of the heart works, and how God uses the unrepentant to glorify Himself. What I am writing here is not some concocted doctrine, as seen above; it is Scripture, lots of it. Doctrines espousing the freedom of humanity do so without an understanding of God, they take a perceptive that is wholly human that is derived from human experience and broken understandings of liberty. Freedom, true freedom is found in the person of Jesus Christ. Through Christ, we are made truly free, and brought closer and closer to redemption day by day. We are made more like Christ, and in so being, come closer and closer to our original created state becoming the true image bearers of God that He intended in the garden. It is in this then that freedom is defined, not in some innate sense of human entitlement. True freedom, the only freedom that matters is found in Jesus. All other definitions or versions of it are shallow and empty, all others are false. Now even with this language (and some of it is admittedly strong) I do not consider those who cling to their freewill as not in Christ. I do not consider their salvation to be in jeopardy for in doing that I would actually be affirming their own understanding of God. No, salvation is completely and totally a work of the divine of which we reap all of the benefits. But I do believe that Christians who cling to their understanding of freedom to the point of restricting God do so to their own harm which is why I have written this mammoth post. I hope that some who read this recognize that God is so much bigger than they could possibly perceive and not ignore or explain away clear text for the sake of some need to make God smaller than He actually is. Peace and blessings and as always, thank you for reading. Autonomy- the state of existing or acting independently of others. Predestined- a decision made before the actual event. Repentance- the action of turning away from sin towards God. Determinism- the notion that decisions regarding events have already taken place before the events themselves have come to pass.